The Facilities Services (FS) finance team earned a Best Practices award from Central Association of College and University Business Officers (CACUBO) organization. CACUBO, founded in 1909, was the first of four regional associations to be established as part of the National Association of College and University Business Officers (NACUBO). The national association seeks to improve business and financial management in higher education and represents more than 2,100 members from colleges and universities across the country. The Best Practices award promotes new approaches to the problems and challenges facing college and university business operations. The FS finance team earned second place in the Research Institution category for designing and implementing Checklist to Check, a process to ensure timely construction contractor payments. The new process shortens the timeline to pay construction contractors for their products and services and it reduces the consequences associated with delayed payments such as work delays, property liens, and increased fees. 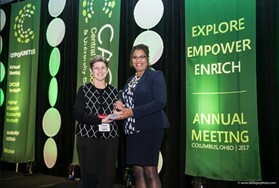 Arleta Porter, Executive Director of Finance and Business Services accepted the award in October in Columbus, OH.